I charge a fee of £350. This includes initial meeting, writing first draft of ceremony and revising draft until it’s just right for you both, liaising with people involved in ceremony, rehearsal of ceremony, which may include readers, singers and musicians, supporting family and friends, use of ritual, family objects, and of course conducting on the day the ceremony with heart warmth feeling and meaning. The payment is made in stages. At the initial meeting I ask for £50 which is offset against the cost should you wish to proceed. I then ask for £100 for the first draft of the ceremony to go ahead, this is a non refundable deposit. I will invoice you for the remainder of the fee, £200 payable prior to the ceremony plus any agreed expenses incurred beforehand. Some couples choose to include in their ceremony a very special moment to share with their guests, making their ceremony truly unique and memorable. Many of these symbols and rituals have their roots in ancient traditions and customs, but today become an unexpected aspect of your ceremony that will delight your guests and make your wedding ceremony truly unique. In this wedding ceremony the Bride and Bridegroom exchange a single red rose as a symbol of their love and commitment on their wedding day. A single red rose always means “I love you” and becomes their first gift to each other as husband and wife. I ask that the couple pick one very special location in their home for roses, and that on each anniversary they both take a rose to that special place, as a recommitment to their marriage each year and an affirmation that this is a marriage based on love. 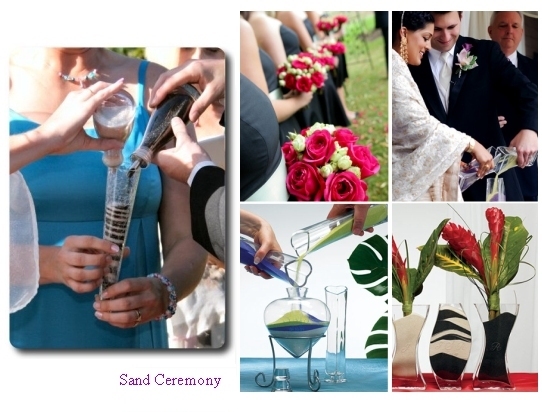 During the wedding sand ceremony, different coloured sands are blended together. The Bride and Bridegroom each take a small a jar of sand of a different colour and pour them into a third container swirling the sands together bit by bit. Just as the mixed grains of sand can never be separated, so too will the couple be joined together in marriage and never separated. 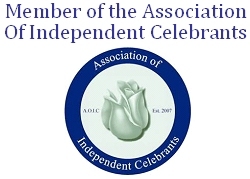 The candle lighting ceremony symbolizes the joining of two people and two families. The mothers of the Bride and Bridegroom light a candle, which symbolizes the family of each, and the individuality of the Bride and Bridegroom. 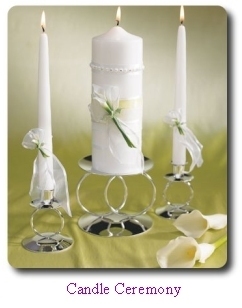 At the end of the wedding ceremony the Bride and Bridegroom each take a flame from their family name candle and bring the two flames together to light their single marriage candle. This is candle of unity because the Bride and Bridegroom must come together, giving a spark of themselves, to create a new light. This unity candle then becomes their Wedding Anniversary candle, to be lighted this day every year, for the rest of their lives. A favourite with Bridegrooms, this ritual involves the Best Man pouring a goblet of wine and handing it to the Bride and Bridegroom. The celebrant invites them to take a sip of wine for each blessing. Bride and Bridegroom each sips from the cup.